Enjoy your Vitamin C in the naturally sweet tropical flavours of fresh banana, mango, passion fruit, kiwi, cherry and lemon. Vitamin C promotes healthy capillaries, gums, and teeth and aids in iron absorption. It helps heal wounds and broken bones and, by increasing the absorption of iron from the intestine, it helps treat anemia. Vitamin C plays a role in collagen formation within connective tissue and it contributes to hemoglobin and red-blood–cell production in bone marrow. Contains no: Salt (NaCl), Starch, Gluten, Lactose, artificial flavours, colours or preservatives. 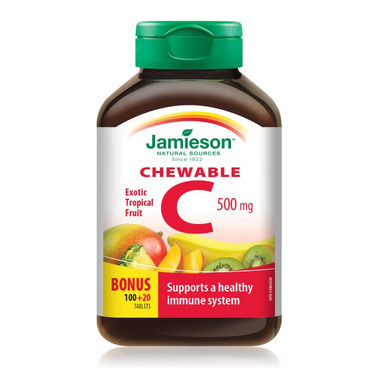 Been using these chewable C's for a long time. My entire family can hardly wait for the daily morning dose! Tastes great! Easy to get the family to take their vitamins! I prefer theses than the orange ones. It's a large size and is like a treat when I need something sweet in the afternoon. Almost too good - they taste like candy - hardest part is not eating too many. The best Vitamin C I have tried to date! Highly recommended over all other brands. My favorite Vitamin C ever! As a pharmacist I use and recommend Jamieson products. Well made. This is my favourite go to vitamin C. Love the flavours. I love Jamieson. Never any complaints -- and it's Canadian! Yummy; the whole family loves it !